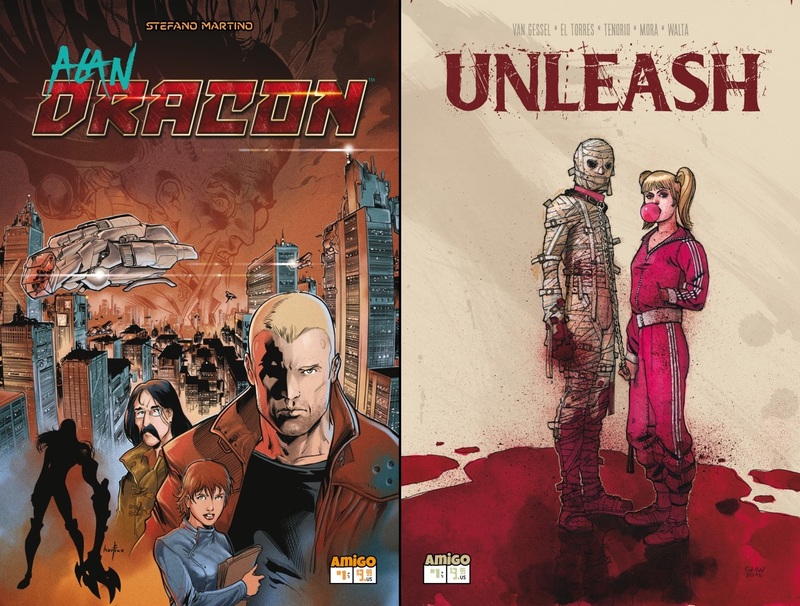 The Newest Rant: Reviews of Two Debuts from Amigo Comics--"Alan Dracon," and, "Unleash." Reviews of Two Debuts from Amigo Comics--"Alan Dracon," and, "Unleash." Amigo comics is a smaller publisher who have put out some good stuff--I was a fan of, "The Westwood Witches," for example. 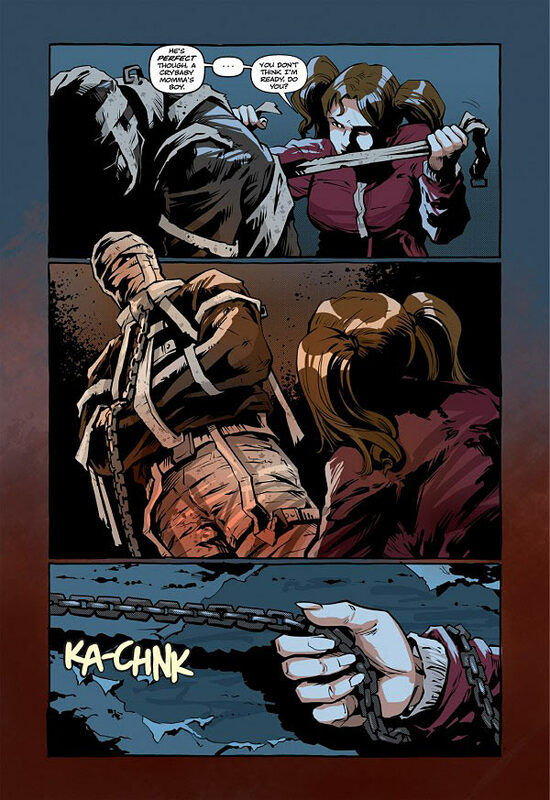 They also did a clever scary comic where the Pope is possessed by a demon titled, "Roman Ritual," and had another horror-hit in the form of their series, "Straitjacket." They recently just launched two new series I had the opportunity to grab and read. I enjoyed both but have a favorite of the two. it's up to Alan Dracon to find out who or what it is. 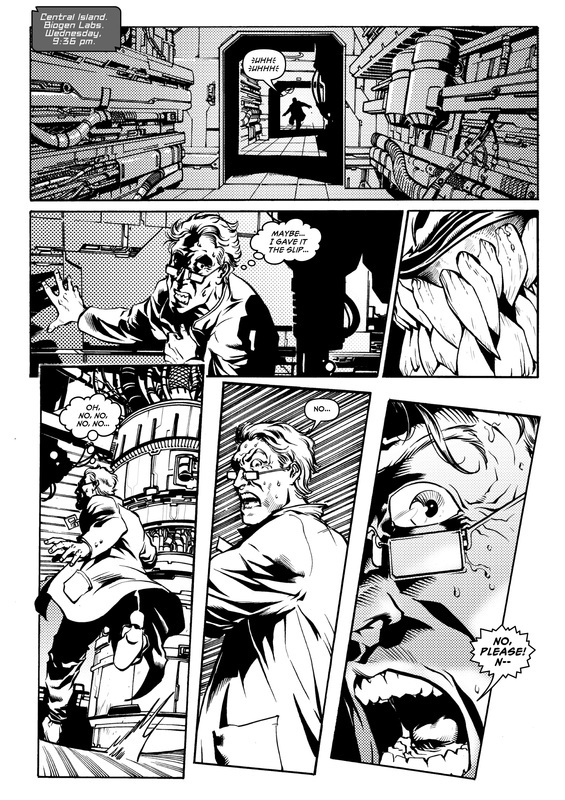 A black-and-white science-fiction comic, I found, "Alan Dracon," quite enjoyable. 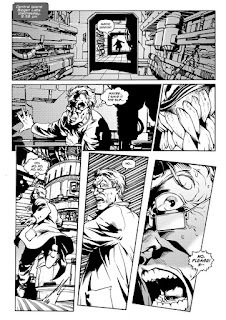 Written and illustrated by Stefano Martino, it takes place in a future where technology and corporate espionage run wild. Alan Dracon is a private security guard who is hired by a big company after some gruesome murder results in them being concerned their bio-research is being stolen. Considering this is a six-issue mini-series I was both surprised and pleased to see the mystery behind who could be the killer solved relatively quickly. Normally comics will give us main characters--such as our Alan Dracon--and tell us they are skilled and intelligent, but then it'll take forever for an obvious mystery to be solved. The fact that Dracon is hired by a company to provide security and figure something out--and then actually does that, instills confidence in the reader we are in fact reading about someone as dangerous and smart as we are told. 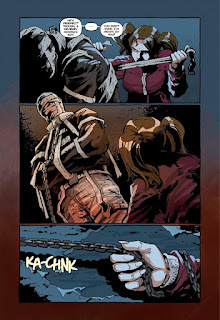 Even though this issue involved a lot of sleuthing and sets-up what will surely be an action-packed 2nd issue where the murderer is going to be confronted, there still was some good action in this issue, and Martino's artwork compliments his writing quite well. Were I to have a complaint about the comic, it would maybe be that we only get some peeks into the mind of our title character, through the narration he provides which makes it clear he's a skilled yet sad and lonely individual. I would really like to learn more about Alan Dracon and imagine the upcoming issues will tell us more about him. This was an all-around great debut that gets me excited to see more of Alan Dracon in future issues. The, "Machine," is suitably imposing. If I loved, "Alan Dracon," you could say I simply liked, "Unleash." It has an interesting and twisted idea, where a young woman named Emmie who was sexually assaulted in the past has trained some sort of twisted man to be an unfeeling machine that goes out and rapes rapists. An incredibly dark concept, this issue raises some intriguing questions (who is the machine?) and already seems to intentional be making readers wonder if the young woman who is assaulting criminals with the assistance of her machine is a bit of a monster herself too. The thing is, the book drags a bit with the introduction of some secondary characters who seem to be present to do little more than move the plot along, and a last-page twist that I saw coming from a mile away didn't impress me either. Written by Jennifer Van Gessel and El Torres with art by Gabriel Hernandez Walta, the book looks really good--with the so-called, "Machine," appearing absolutely terrifying--but Emmie needs more fleshing-out beyond the fact we are told she is herself a victim who now goes out and hurts the victimizers. I see a good deal of potential in this title to impress me as it goes along, but as of right now the first issue stumbles a bit out of the gate. The series could very well find its footing and become a stellar read, or take a tumble and be a great idea with mediocre execution. I guess we will just have to stay tuned to find out! Plus, even if I don't like the comic in the end there is apparently a movie based on the comic which will be coming out soon, so that's snazzy too! I look forward to the next issue of, "Alan Dracon." These new books from Amigo Comics both have some great ideas, and while one book is really fun and the other has some flaws I enjoyed both and am interested enough in each title to keep following them to see where the stories could go. I encourage you to check out these comics out as you'll probably find yourself wanting to read future issues too!